There are some shows on the Food Network that I watch regularly. Every now and then I see a recipe which makes me want to rush into the kitchen and try it out immediately. This was one such recipe that looked really good. I modified the original a bit by adding a couple of other ingredients. 2 cloves garlic, crushed and made into a paste like this. Throw all the ingredients together in the blender and process until just blended, 30-45 seconds. The batter will be thin. Pour the batter into the muffin cups filling each cup three-fourths full. Bake for about 30 minutes until puffed and golden brown. Do not peek into the oven for the first 30 minutes! I also let the popovers sit in the oven for another 10-15 minutes after turning off the heat for the tops to get well browned and crusty, and also for the insides to dry out a bit. Serve right away; they start to deflate almost immediately. The popovers had a nice and crisp exterior with a slightly hollow, soft interior. These were perfect along with soup. This post has some very useful tips on how to make the perfect popovers. On a different note, I just realized that I’ve now been blogging for a year. I’m really surprised since I always thought that nothing could hold my interest for long! Congrats on your anniversary!. The popovers are so perfect, like laavanya mentioned. Lovely picture. Congrats on your blogiversart, TBC. Lesson to myself: NEVER visit TBC's blog before going to bed. It is impossible to sleep with a salivating mouth. I love popovers, but never thought to make a Parmesan version. A must try. A very happy blog birthday to you! I look forward to another year of your delicious creations. Savoury is the way to go :) They look delicious! Congrats on your first blog anniversary, I'm glad you didn't lose interest :D.
Lovely stuff... perfect with soup :-) I'm bookmarking this. The year went by pretty fast, didn't it? Happy 1st, TBC. Love your popovers. They would make a nice addition to the bread basket of an Italian dinner. the pop overs look amazing! its great that u cud take the pictures before they deflated!! :-) thanks for all the additional info, TBC! 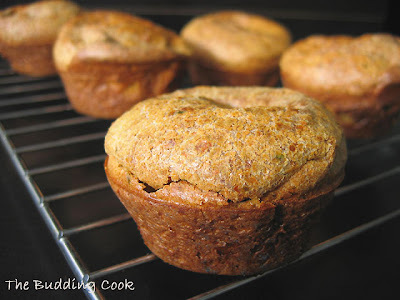 Parmesan popovers look like great muffins,thanks for sharing. the popovers look so inviting and beautiful. Congrats on completing a year of blogging. Wishing you many more. So cute! :) And congrats on the first anniv. May you have many more! Popovers sounds delicious and savoury ones are not seen so much.. these will be devoured in seconds!! I have never tried popovers, and these look irresistible! I love anything parmesan. Yum, popovers! They look delicious, TBC. TBC! I love your blog! Thank you for the encouraging comments and Happy One Year Anniversary to the 'The Budding Cook'. Oh popovers... I haven't made them in such a long time, they are great with a good soup... your recipe looks great. Those parmesan popovers look good! Clafoutis...popovers...there are delicious things cooking in this kitchen! Congrats on your first anniversary in blogsophere! thats indeed a great milestone! Beautiful popovers..
Great looking poppers. I am surprised that they rose so well without any baking soda/powder! Thats amazing. Oh, these popover sound and look so delicious! They are easy to make too. A must try. Also, happy anniversary to you!! Wishing you many more years of blogging! Please try them out, I'm sure you'll like 'em. Rajitha- thank you, my dear! I'm glad that I'm still here. Sujatha- Thanks! :D I never thought I'd last this long! Farida- I'm so glad to see you here! I love your blog. Seom of your recipes are simply great. I have gone back to check out your Zebra cake so many times now! Namratha- it's so nice to see you here! I have not been blog-hopping as much I used to...too much to do these days! How have you been?